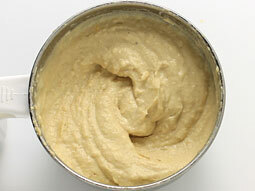 Hummus, a healthy and protein rich dip from Middle Eastern cuisine, is made from chickpeas (grabanzo beans). This thick and creamy Hummus dip has nutty flavor and is very easy to make at home since it requires minimal cooking process and you can never go wrong regardless of fact whether you know cooking very well or not at all. 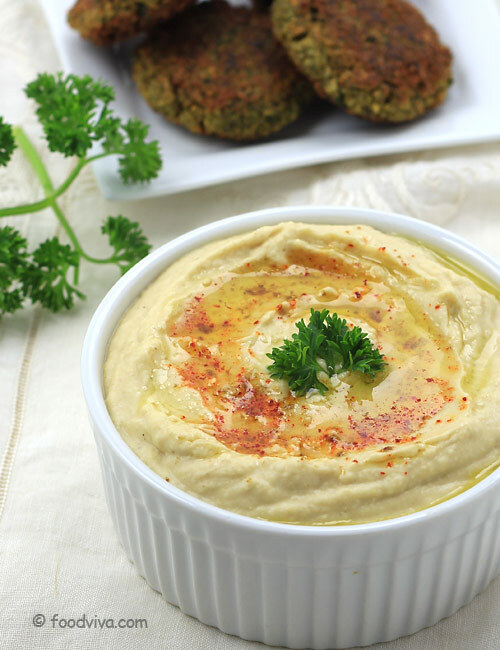 It is prepared by blending cooked chickpeas (or canned chickpeas) with tahini, garlic, lemon juice, olive oil and salt until smooth and this Hummus Recipe explains this entire process with step by step photos. Enjoy it by serving it as a dip with crackers, pita chips, cut vegetables (carrot, celery, broccoli, zucchini) or as a sauce with falafel and pita bread or as a spread in sandwiches. 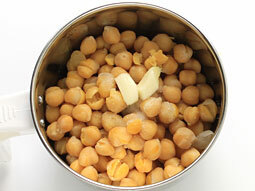 If you are using canned chickpeas, skip step-1 & 2 below. 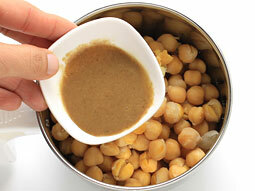 Drain the liquid and rinse chickpeas in water. 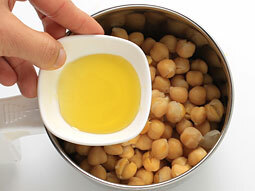 Do not use canned chickpeas water in step-8 while blending. 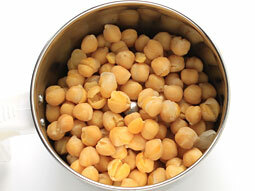 Soak 1/3 cup dried chickpeas in 1-cup water for 8-10 hours or overnight. 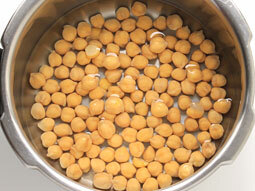 Drain the excess water from soaked chickpeas and rinse them in water. Transfer them to a 2-3 liter capacity pressure cooker and add 3/4 cup water and salt. Close the cooker with a lid and pressure cook for 4-5 whistles over medium flame or boil in salted water in a medium size pan until soft. Open the lid after pressure releases naturally. 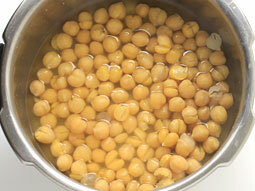 Drain excess water from cooked chickpeas and reserve it (it will be used while grinding in later steps). 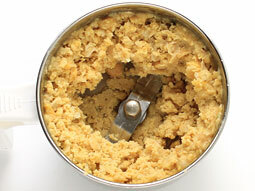 Transfer drained chickpeas into food processor or a mixer grinder jar. Add garlic, lemon juice and salt. Blend until medium coarse texture. Pour approx. 1/3 cup water. Scrape the sides with a spatula for smooth processing. Blend again until smooth texture. 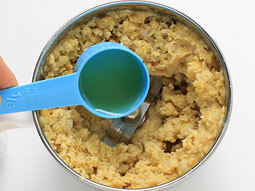 If the mixture looks too thick, add 2-3 tablespoons more water and process again. Taste for the seasonings at this stage and if required add more and process again for few seconds. Healthy Hummus Dip is ready; transfer it to a serving bowl. Drizzle some olive oil and sprinkle a pinch of red chilli powder over it as garnish. Store it in refrigerator consume it in 5-7 days. Don’t replace olive oil with any other oil. Adjust the quantity of lemon juice as per your preference. 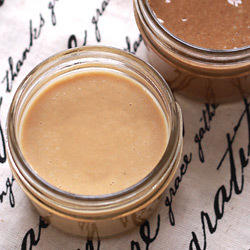 Tahini is an optional ingredient; you can also make Hummus without adding it. Serving Ideas: It tastes best when served as a dip with crackers, chips, fresh cut vegetables (carrot, celery, zucchini, broccoli), warm pita bread, pita chips, falafel etc.